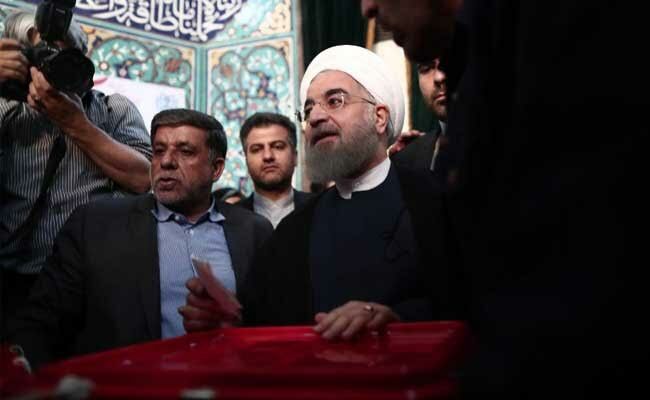 Polls in Iran opened today as incumbent president Hassan Rouhani hopes to fight off hardliner Ebrahim Raisi to secure a second term. Rouhani, a 68-year-old moderate cleric who spearheaded a 2015 nuclear deal with world powers, has sought to frame the election as a choice between greater civil liberties and "extremism". "We are still not pleased with the situation, but in the four years of Rouhani there has been a relative improvement and I'm voting to keep that," said Alireza Nikpour, a 40-year-old photographer in Tehran. Together, they helped secure the landmark deal with six powers led by the United States that eased crippling economic sanctions in exchange for curbs to Iran's nuclear programme. "The enthusiastic participation of Iranians in the election reinforces our national power and security," said Rouhani after casting his vote. Raisi says he will stick by the nuclear deal, but points to a persistent economic slump as evidence Rouhani's diplomatic efforts have failed. "Instead of using the capable hands of our young people to resolve problems, they are putting our economy in the hands of foreigners," he said at a closing campaign rally in second city Mashhad on Wednesday. "I think the most important factors are the ones we had a revolution for, like establishing social justice and removing poverty," said 23-year-old engineering student Mohammad Ali Serkani at a polling station in Tehran. "I voted Raisi because the Rouhani government and the nuclear deal stopped a lot of research in scientific fields such as nuclear, missile and space technology," he added. Rouhani has warned that hardliners must be kept away from Iran's diplomatic levers at a delicate moment in relations with the United States. "One wrong decision by the president can mean war," he said at his own Mashhad rally. Supreme leader Ayatollah Ali Khamenei cast his vote at his compound in Tehran just minutes after polls opened, saying: "The destiny of the country is in the hands of Iranians." "For me, Mr Rouhani's dialogue with the world and moderation in society are very important," said Zahra, a 32-year-old PhD student in food science at another Tehran polling station. Under Rouhani's predecessor, hardliner Mahmoud Ahmadinejad, "the sanctions really hurt us. It was hard to get lab equipment and very difficult to get visas to study abroad. Now my colleagues can travel to France and the US," she said. Iranians are also voting for local councils, with reformists hoping to topple the conservatives' narrow majority in the capital.